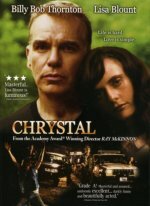 Chrystal release date was Friday, April 8, 2005. Sixteen years ago while being pursued by the law and high on drugs, Joe (Billy Bob Thornton) was responsible for a car accident that killed his young son and seriously injured his wife, Chrystal (Lisa Blount), breaking her neck. Returning to his hometown in the Ozarks of Arkansas after his time in prison for the accident, Joe is faced with the challenge of finally coming to terms with Chrystal, who is still plagued with pain, both physical and psychological.